Course Description — Students will study the elements of art. They will complete their own projects using all of the elements as well as find them in artwork that is representative of the time periods they are studying. Special topics include: complementary colors, positive and negative space, geometric and organic shape, and Native American art. Explore complementary colors. Make sure you do watch, find and create. Do this complementary colors project. Follow the directions. Color in the circles in a pattern: green, blue, violet. Trace and color your hand and the colors that complement each circle. The page lists different mediums you can use. You can use paints if you like, but you can also use crayons. There are others listed as well. *Print this circle sheet to get started. Try this complementary colors project. You don’t have to use black marker or paints. You can use crayons. If you really don’t think you can write your name in block or bubble letters, then you can do the project below. Do this complementary colors project. Follow the directions. 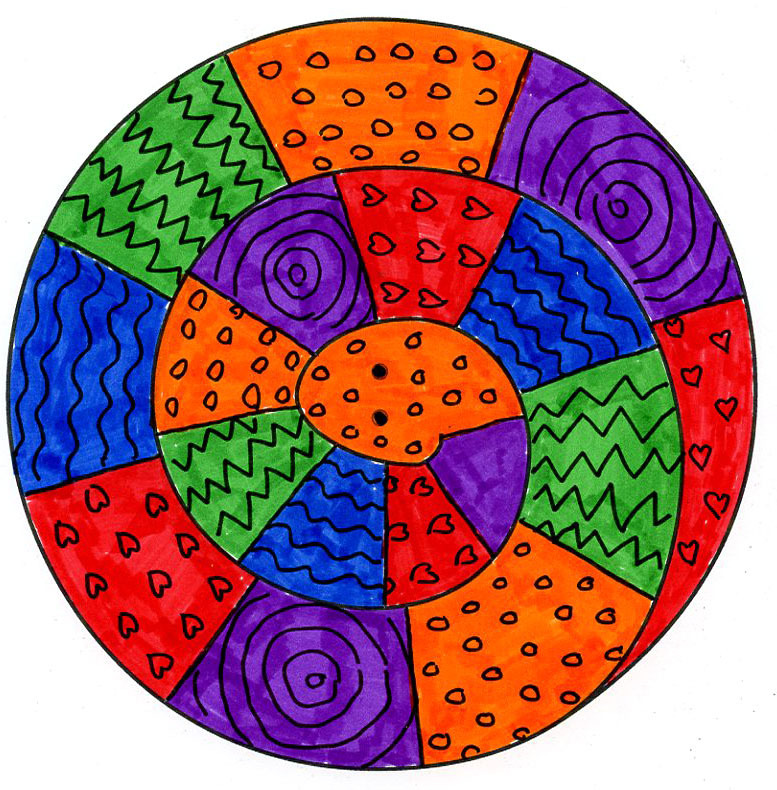 Color in the circles in a pattern: green, blue, violet. Trace and color your and the colors that complement each circle. The page lists different mediums you can use. You can use paints if you like, but you can also use crayons. There are others listed as well. Look at the colors in these paintings. Find complementary colors in each one. You can read the descriptions of the use of color in each painting as well. Look at these examples of Iroquois artwork. Which do you think are the hardest to do? Which do you think are the coolest? What kinds of images did they use on their artwork? What colors did they use? Here is another example of Native American artwork, beadwork. What colors do you notice? What shapes do you notice? What images do you notice? Make your own online beaded project. Where do you see movement in the paintings? Look at different kinds of lines used in art. Here are some more line examples. Draw 5 different kinds of lines and label them. Look for them when we look at artwork. You can include this in your portfolio. Read about the style of painting done by limners in Colonial times. Look at these three limner paintings. Can you see limner characteristics in them? Read about the limners of Colonial times. What characteristics defined their paintings? 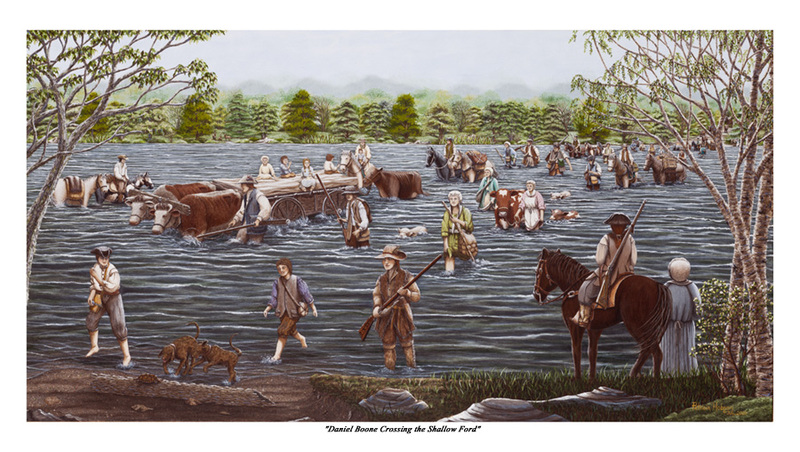 Look at these paintings of Daniel Boone. Notice the use of lines. What kind of lines can you find? Look at this page of French and Indian War paintings. Find at least one use of complementary colors and three different types of lines. *Make a tri-corner hat. (If you don’t have construction paper or cardboard, you can glue two pieces of regular paper together to make it stiffer. Decorate your hat however you like. Here are pictures of the tricorne hat. Look at these examples of value. Draw simple strips and shade them from dark to light like in the examples, or draw a 3D shape and shade it as in the examples. 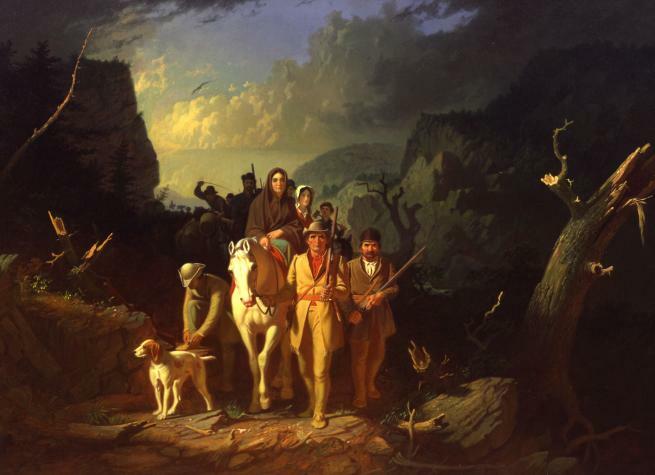 Look at the values in the Daniel Boone portrait. Learn about positive and negative space. Make sure you watch, find and create. Do this positive and negative space project. You’ll cut shapes out on the fold of different colored 3 in. by 3 in. papers. Then you will glue them onto a dark piece of paper. (If you don’t have American construction paper, fold your paper to divide it evenly into squares and use that size square. You will need two different colors of paper. The directions sound confusing, but just start following them and I think it will be clear. Take one of your papers. You will cut shapes out along the two long edges while leaving the corners uncut. Now you will take your other piece of paper and glue on the pieces you just cut out. Flip your paper over and glue on the long middle piece with the corners, which was left over from what you cut. Just give it a try. Where is the positive and negative space? Look at the Revolutionary War artwork. Look at the American Revolution artwork. Look at this painting of Paul Revere’s ride. Can you find complementary colors, negative space, and three types of lines? Analyze the painting, The Midnight Ride of Paul Revere. Look at these paintings and drawings. What textures do you see? Scroll down to “Techniques that use Texture.” Read it and look at the examples. These use texture to make things that look real, like you could reach out and touch them. Van Gogh These are different. It is not trying to emulate the real texture of an object. Van Gogh used brush strokes to create texture marks on his painting, making it much more interesting. Chardin was an artist during the 1700s. Listen to how to say his name by clicking on the the little speaker icon. Look at Chardin’s artwork for lines, colors and textures. You can click on them to see them bigger. What type of scene does he typically draw? Tell someone what you observed. Read about him and his work. Tell someone what you learned and observed. Create artwork with 3D textures. You will make a collage. Scavenge around your house for fabric, yarn, toothpicks, wood chips, magazines, and anything else interesting that you are able and allowed to glue onto a piece of paper. Create a picture on a piece of paper by gluing down what you found. It doesn’t have to be a picture picture. Make an interesting design. Think about line, color, and texture. You could take a picture of this and include it in your portfolio. Look at Plains Indian artwork. It is very similar to the artwork we looked at for the Iroquois. What lines, colors, shapes and textures do you see? If you want to make a craft, you can choose one from this page. Look at these drawings by Lewis and Clark. Draw something in your house. Add enough details that whomever you show it to knows what it is (eg. not just a couch, but a certain couch). Does this painting look like it has texture to it? I think it does. Look at some of the other paintings. On which paintings do you think the soil art works best? If you are doing Year 2, Early American History, then make props and costumes for the skit you will read for history on Day 109. You don’t have to use the exact materials recommended. Use construction paper. Use what ever you have. Be creative. If not, you can do the assignment below. The Star Spangled Banner, America’s national anthem, was written about a battle during the War of 1812. Here is a landscape scene from what might have been travelers on the trail. You have looked at a lot of portraits of people. Look at this landscape painting. A landscape painting is a painting of scenery. This painting is not about the people. 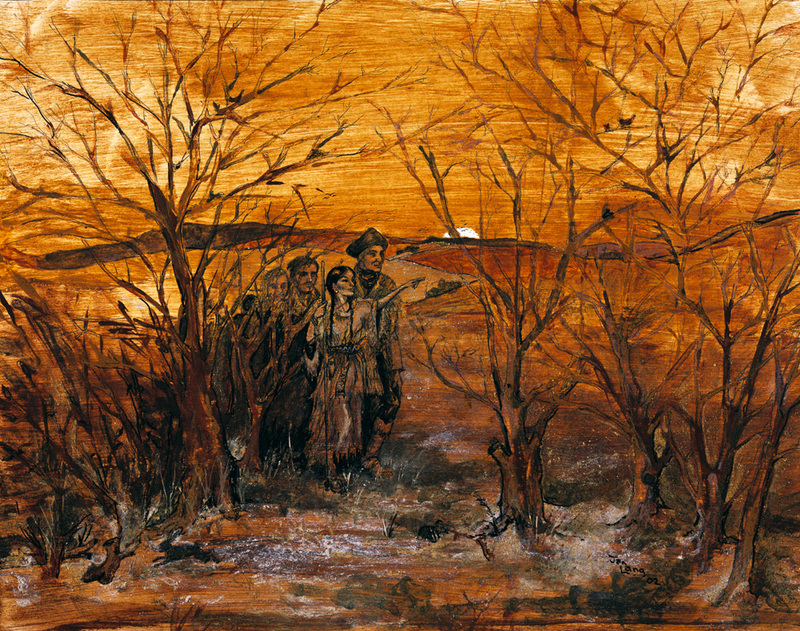 There are three main areas of a landscape painting: the foreground (what’s up front), the middle ground and the background. It’s like three layers. The people are in the foreground. Can you see the middle and backgrounds? The background is not really clear. The top of the mountain is kind of covered with some clouds. It’s not sharp. I think the focal point is where the light hits in the middle ground. What’s in the foreground? middle? back? Again, the background is muted, not clear. It’s far away. The foreground in this picture is the plants. They aren’t important. The action is in the middle ground. Scroll down on this page and choose a “wall” to look at. These are by the man who painted the waterfall picture. Look at some of his many landscape paintings. Some you can click to see bigger, some you can’t. Draw a landscape of a wheat field. Make observations. Can you find complementary colors? What types of lines and textures can you spot? Learn about organic and geometric shape. Make sure you watch, find and create. *Cut out these shapes. Color and glue them, overlapping, onto a piece of construction paper (or other paper). Now, tear up pieces of colored paper (or color white paper and then tear it) into any sort of interesting shape. They don’t have to look like anything. Glue those pieces onto your paper. Cover your whole paper. Which shapes are geometric? Which shapes are organic? Do this geometric and organic shapes art project. Follow the directions. You will need to let it dry before you finish it. Trace shapes you find around your house: cup, coin, computer speaker, eraser…You could also print these and use one or all as templates. Color them with the markers. Follow the directions to add water and let the colors bleed to make organic shapes. Look at these paintings and drawings about slavery. What observations can you make? Look at the painting of slaves being taken away in a cart being pulled by a horse. What geometric and organic shapes do you see? Look at this page on pattern in art. Scroll through these pages and look at patterned artwork. Read about how the slaves made quilts and used patterns to send secret messages. Read about the meaning behind quilt patterns. *Choose one of these pages to print and color to make your own secret quilt pattern. Read about the language of quilts. Click on Find out More at the bottom of the page. Read that page and the different quilt patterns. At the bottom of that page click on Make your Own Secret Quilt Message. Print out this snake template. Follow MY directions. Color each section in a pattern such as: blue, red, green, blue, red, green, or any pattern you like. Use a color pattern like above, but instead of coloring it in, drawing a pattern with that color in the space. You could draw squiggly lines with orange, then diagonal lines with green, then poke-a-dots with purple, then do it all over again in a pattern. Or, you can combine the two like this example. This uses marker with a thin black marker for design drawing. When you are done your pattern, cut on the black line and hang by a thread attached to the head. Here are directions. Print out this template of a leaf. 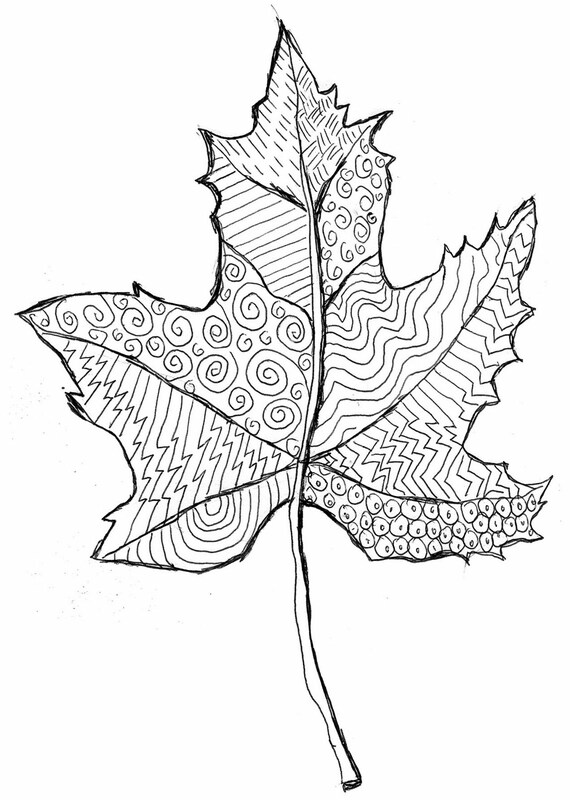 Fill in a pattern in each section of the leaf. Here is an example. Look at these paintings of the Civil War. You can click on any of them to see them bigger. Look at this one painting in particular. What patterns of lines do you see? What types of lines? Can you find complementary colors? What shapes do you see? Textures? Look at this Civil War artwork. Choose one painting. Look at it closely. Describe your observations about line, color, shape, pattern and texture. Look through this Civil War artwork. Choose a piece and describe your observations about line, color, shape, patter, texture and value. Look at and read this page about space. What is the clown’s message? Look at and read about these examples of the use of composition (the use of space) in paintings. Do this spider web project. However, don’t just copy what they did. Think about line, color (complementary colors), shape, space, pattern and texture. Maybe the center of your spider web will not be in the center of your page. Think and make decisions. Draw your spider web design in black. Then you can start filling in the spaces. Use textures, patterns, shapes, and smart color choices. You can finish this next week. Do this art lettering project. You can think about line, color (using complementary colors), shape, space, pattern, texture and value as you work on it. You don’t have to use watercolor pencils. You can fill in the areas however you choose. Think about all of the elements of art we learned about this year and make decisions about what to do. Don’t just do it randomly. You can finish this next week. Finish your project. Yeah! Great job! Read this poem on the elements of art.